Senate President, Miller, addresses press vowing to keep Maryland Safe against detrimental executive actions of Trump administration. Today, Maryland citizens, activists, and lawmakers joined together to denounce the hate speech, bigotry and regressive actions of the Trump administration. Our message was loud and clear: Democratic lawmakers will do everything in their power to prevent backwards progress in the state. 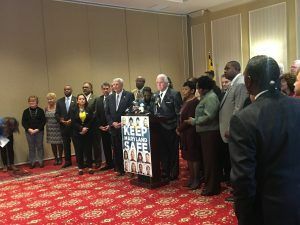 The gathering implored fellow lawmakers, in Annapolis, to discredit policies and actions that do not reflect, or advance the interests of Marylanders. New legislation was proposed to provide some push back from recent Federal Executive Orders, and policies. The official press release can be read, in full, below. Annapolis, MD – Speaker of the House Michael E. Busch, Senate President Thomas V. Mike Miller, Jr, and Attorney General Brian Frosh, joined by Democratic Senators and Delegates today announced a package of legislation to make certain that Maryland will be prepared for potential negative actions from President Trump and the Federal Government. v Maryland Defense Act of 2017 (Kasemeyer & Madaleno/Rosenberg) – Legislation and Resolution to provide the Attorney General with the directive and the resources to engage in offensive or defensive action to protect citizens of Maryland from harmful federal efforts. The Bill & Resolution also outlines steps the Attorney General in consultation with the Governor, and allocates $3 million a year including five staff members in the Attorney General’s office to take the necessary actions. v Repeal of Affordable Care Act Resolution (Conway/Moon) – The Affordable Care Act (ACA) provides or helps to provide health insurance to over 400,000 Marylanders, assists seniors with prescription drugs, eliminates pre-existing condition barriers and allows children to stay on their parent health insurance. President Trump and the Republican Congress have been clear that repealing this important legislation is a top priority – even without a replacement plan. Maryland is at risk of losing $7.7 billion over the next 4 years should this happen. This Resolution calls on Congressional Delegation and the Governor to strongly oppose and resist any repeal of the ACA. v Maryland Health Insurance Coverage Protection Act (Middleton /Pena-Melnyk) – Marylanders should have access to high quality healthcare, regardless of pre-existing conditions. In light of the President and Republican Congress pushing to repeal the ACA, the General Assembly will create the Maryland Health Insurance Coverage Protection Commission with the purpose to monitor work on the Federal level and prepare Maryland to best react should President Trump and the Republicans in Congress decide to take away health insurance coverage from the hard working middle class. v Maryland Financial Consumer Protection Task Force (Rosapepe/Frick) – After the Great Recession, real progress was made to provide consumers with real financial protection, and ensure that banks couldn’t hurt the American consumer. With the rhetoric in Washington, it is only a matter of time until President Trump and Congress begin to repeal these measures. This legislation establishes the Maryland Financial Consumer Protection Task Force to monitor federal changes and keep the Governor and General Assembly updated on those changes. v Constitutional Convention Withdrawal (Madaleno/Frick) – Several times in the past century Maryland signed off as signatories to Article V Conventions – to allow for a Constitutional Convention on a variety of issues. With the current political climate now is not the time to rewrite the Constitution to endanger Americans. This Resolution will withdraw Maryland from all previous Article V Convention calls to make more certain that there will not be a Constitutional Convention under President Trump.